In the liturgy of the ancient Church, after the homily, the Bishop or the presider of the celebration, the main celebrant, said, "Conversi ad Dominum". Then he and all [others] stood up and turned towards the East. All wished to face towards Christ. Only if converted, only if in this conversion towards Christ, in this common facing of Christ, we may find the gift of unity. ... many are under the impression that this [from versus Dominum to versus populum] change simply represents the revival of an early Christian practice. But we can show with certainty that there has never been, neither in the Eastern nor the Western Church, a celebration versus populum (facing the people); rather, the direction of prayer has always been towards the East, conversi ad Dominum (turned toward the Lord). The idea that the priest is to face the people during Mass has its origins with Martin Luther, in his little book, The German Mass and Order of Worship (1526). For devotions for the Chair of Unity Octave, see here. No, no, we can't do that. That's not what the Pope was trying to say. He was just trying to say let's face God in prayer, each local custom to prevail. Modernism. The enemy of tradition. Friend of the enemies of Christ. Does anyone else get the feeling, that it stating this...in addition to celebrating Mass "ad orientam" last week in the Sistine Chapel, our wonderful Holy Father Benedict XVI is preparing us for a perhaps soon to come ruling that we are to go back to older, original altars, with the priest "with his back to the people" while saying Mass. 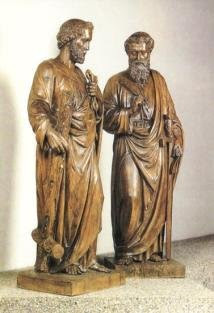 I would not be surprised if there is soon a document issued by or in the name of the Pope ordering a return to the "ad orientam" posture for priests celebrating Mass, and a supression of the horrible Protestant-style table altars that have been set up in front of magnificent altars which are in many cases true works of art. Bit by bit, I think Benedict XVI is preparing us for it....and the ruling will come sooner than we think with little or no prior announcement. We "turn toward the Lord," but that still leaves the sacrilege of Eucharistic ministers and Communion in the hand, not to mention the abomination of girl altar boys. The Holy Father has many rows yet to hoe. Good luck! Seems that most older churches have had their altars removed in favor of the modernist's table, and on the other hand, the awful new churches never had altars, but only tables to re-enact the Lord's Supper and not offer the Mass. The Holy Father may well be setting the stage to change the NO to be a "Conversi ad Dominum" Missae as well. Interiorly, I am convinced that this is where the Holy Father is going with this. The other NO abuses as belloc aptly stated will be further battles to fight. The fact that the Holy Father is intent on "applying the reforms on V2" may mean that he will clean up a good number of these abuses if God permits him the time. He has already made numerous calls to return to Gregorian chant and away from profane music. 4 Eucharistic prayers, plus local approved variants. The largest one being the ecumenical aspect - the announcement of an "ecumenical" chapel where pagans, heretics and schismatics can offer their various sacrifices and worship, none of which are pleasing to God, along with Catholics, at St Paul outside the Wall, *apparently* has the go ahead of the Holy Father. Add to this, the lingering rumours that the Holy Father will scrub the Good Friday prayer of conversion from the 1962 Missale, and we have an ecumenical problem now on top of all the rest. 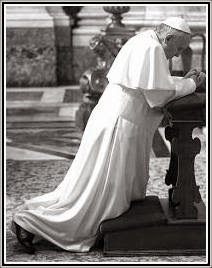 Let's pray much for the Holy Father. In this author's humble view, BXVI is still a long way off from Holy Tradition. So we've moved on to the next irritant, facing East. Another warning. Any results from the other great suggestions? Those patient wolves in their orders and dioceses are just waiting and resisting, and the Pope just keeps on asking. In the end, if he doesn't fire a bunch of them or perform THE CONSECRATION, I see him failing like the rest. I hope I'm wrong, but the pattern is warning, warning, and then on to the next irritant. And the wolves know it. Perhaps he has already taken the most important step: by admitting that many of the innovations of the last few decades were incomplete, unnecessary, and misguided, and by bringing traditionalists back into the argument. 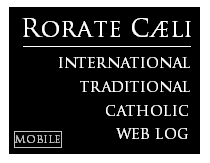 It used to be that when I expressed a traditionalist perspective to one of my Catholic friends they would respond with a "Spirit of Vatican II" stock response and refuse to hear anything else. Now, they still respond with the same canned answers, but are very open to my perspective if I can show that the source of my opinion is Benedict. I consider that a big deal, and I think that the tradition will see a slow but steady return in the seminaries if Benedict is around for a while- God willing- or his successor is of like mind. There is much work to do but the Holy Father has begun by grasping the nettle. The brazilians pro-lifers heed help. Urgent help. The scandal of the DVD produced with a statement of a known pro-abortionist continues. Until now, CNBB (Brazilian Bishops Conference) didn´t gave any public statement about the scandal. The Verbites, same thing. All that despite the documented proofs of the sabotage of Fraternity Campaign. The CNBB just gave an order to recall the first edition of the DVD. Despite that, the first edition of DVD with the abortionist statement still can be bought in catholic bookstores. We need help here. Please, any publicity about this is a bless to us, brazilians pro-lifers. Out shepperds are deff to his flock and the enemies of the Church are enjoying all this mess. The sooner people realise that Mass facing the people is a Lutheran innovation the better. Regaring the Code of Canon Law: the Pope is the Legislator. He can change it whenever he wishes. This code was a fabrication of JPII. Benedict XVI is fully able to make changes. That is a privilege reserved to the Pope. Whoa! If the Pope is the ultimate legislator, what's to stop the next Pope from changing everything Benedict does? Nothing!!!! So either you're wrong, or the Papacy is hardly some bastion of stability. More like a risk magnifer.